Production | Crews | Characters | Props & HUDs | Locations | Building Sets | Shoots | Join in! It is theoretically possible to build everything you need for a shoot: clothing; accessories; shapes and body parts; tattoos and skins; HUDs; animations; props and buildings; and even locations (provided you own land or have access to changing it). But there can be limitations and tradeoffs to this. Even if you (or one of your crew) build these, you will need textures to make them look better and that means either using the ones in the library, uploading your own at $L 10 each, or finding them in-world. Also, building takes time, and it's often quicker (and sometimes cheaper) to find (and probably buy) a resource in-world. This is where sourcing comes in. Sourcing is finding or building resources in-world, and includes the above as well as locations and crew members. Anyone in your crew can source. In particular though, builders might want to source pre-made building sand props; fabricators might look for clothes, body parts and accessories; scouts look for everything and recruit new members. Something that's already built is a pre-fab or pre-made resource. How you search for a pre-made will depend upon what the resource is. For example, searching for a pair of boots with wings on will be entirely different from searching for a location with a waterfall. When in doubt, try searching using a different tab. If it doesn't show in Places, it might in All (web). Sometimes the key is using enough key words to get a result, but not too few so that the result is useless. The results are only as good as the descriptions of objects, things, places, groups and people. If these are minimal, use different terms or misleading, then you may not find what you are after on the first search. Try changing the terms used and see what happens (e.g. use "Shovel" instead of "Spade"). Likewise ratings of PG and MATURE will affect what results are seen. 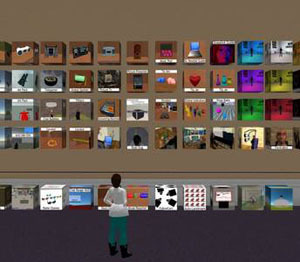 Another place to look is in the Second Life Marketplace website. This has a couple of advantages over using Search in-world. Firstly you are more likely to get hits (even spurious ones) using search on this site. You can sort the results based on category, price, number of Prims and permissions (copy/modify/transfer). Lastly, whereas in-world even if you have a hit on the search you do, you still have to go to the shop/location and find the object for sale (a daunting prospect in some large locations), via the marketplace you pay your $L and it gets delivered directly to you in-world. The limitation of the marketplace is that it will only find things that are placed on it for sale, even if those are free ($L 0). You won't find land and places not up for sale, or people and groups. Second Life isn't the only place with a market place. If you're in a Hypergid Crew there are different sources depending on what grid you're on. You can source on one grid, get "dressed" as a character, and then teleport to another grid for a shoot! While the Marketplace can be good, using Google can sometimes be better. 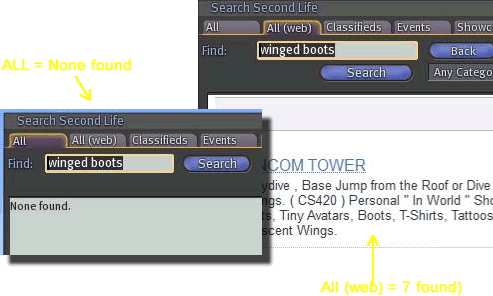 Enter "Second Life" +<your search terms> and you may find what you want the first time. For example, at the time of writing (november 2016), Second Life Marketplace +biker boots brought up a result of MayCreations biker boots skull L for men as the first entry. Another way of finding locations is to have a look at the map. Often you can tell something about the terrain of a SIM by looking at the map. Of course an aerial view like this won't tell you everything about a location. It won't tell you if there are private parcels there which can't be accessed, won't show up sky boxes unless they are relatively large, and it won't show you what the place really looks like. And sometimes the map is slightly out of date. When in doubt, teleport to the location, and if suitable, create a Landmark to send to others in the crew. When sourcing things for a crew, consideration should be given to the permissions on those items. An item that allows for copy and modify but no transfer will be good your avatar but only that avatar. It means that if more avatars need that resource (say a uniform) they'll all need to buy it. That can get fairly expensive in a big crew. When making things for a group, it's best to set the permissions up first, or this will cause trouble down the line. Sometimes you need to have more than one avatar with the same character. That way if one avatar is unavailable for a shoot, another can cover for them. This is something to consider when sourcing for a crew. Buying one or a couple of pre-mades that are no copy but allow for transfer will work, provided they are transferred before a shoot!